Does the so-called Pils – Germany's most popular mainstream beer – constitute a challenge at all for the Craft Beer brewer? Oh yes, it does, at least in our opinion, and a very special one indeed. With our own Pilsner beers we can prove that even the traditional and widespread can still be improved. Our specific recipe of carefully chosen ingredients, combined with our individual and specially developed fermentation, made it possible to create a slender, top-fermented Pilsner which will convince the beer-lover with its attractive hops flavour, a result of a touch of dry hops, as well as with a pleasantly bitter after-taste. Originally, the “Pils” beer is a traditional brew from the Czech Republic. Beer of the “Pilsner” variety (derived from the original “Pilsener Urquell”) is brewed with 100 per cent Pilsner Malt and today is the most widespread type of beer in Germany. As a rule, the hops used in the brewing process comes from the traditional Holledau hops region. In order to give the flavour a final touch, a measure of aromatic hops from the region of Tettnang is usually added. 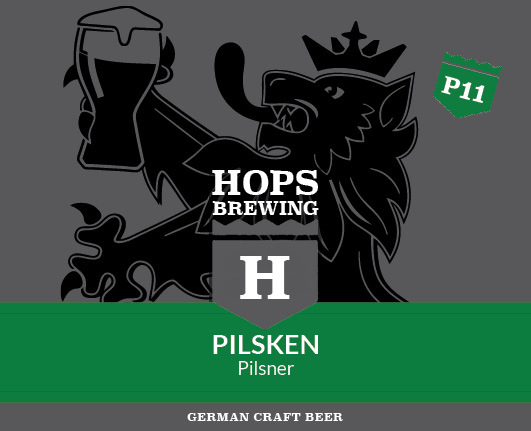 Pilsken – why did we give our Pils that name? Our Pilsken is brewed after the recipe of our master brewer, Ernst D. Freitag, born and raised in Dortmund, a traditional beer-brewing city. Just like the people from the Hunsrück Hills, Dortmunders like using diminutive forms for almost anything. And since he loves this beers most of all, we named it Pilsken, meaning “little Pils” in Dortmund dialect. Franzmann's No. 1 is a pale, slightly amber-coloured Lager with a convincing, distinctly fruity hops aroma and a soft malty note resulting in a refined, bitter taste. The long storage period, in combination with dry hopping using double aromatic hops, produces a savoury flavour of beetroot combined with sweet shades of passion fruit, prune, and pineapple as well as touches of grapefruit and citrus. Very pleasing, tasty Lager building a bridge between Pilsener beer and Ale. Franzmann's No. 1 is brewed after a recipe of our master brewer, Holger Schmidt. Though one of the most widespread types of beer world-wide, Lager does not play a major role in the German beer business. While quite common in the English-speaking world, the term itself is indeed of German origin. The reason is simple: Lager is called Lager because it has to “lager” – to mature, that is – a long time. A typical trait of Lager is its multi-dimensional character: soft and refined due to its malty flavour, fruity and pleasantly bitter because of its distinct hops aroma. Why did we call our Lager Franzmann's No. 1? Red Devil IPA is a top-fermented India Pale Ale of reddish colour created by the special types of malt used. Five carefully selected types of premium hops generate a spicy, but also slightly fruity flavour. The recipe for this reddish India Pale Ale with its surprisingly light and refreshing taste was compiled by Holger Schmidt. Our sommelier recommends to drink it with aromatic and well-seasoned food. IPA originates from 19th-century England and Scotland. At that time, the then very popular Pale Ale was to be shipped to the British colonies. As transports in those days were dispatched by ship and sometimes exposed to high temperatures, the Ale had to be rendered long-lasting and potable for the lengthy voyage. The problem was solved by adding more hops and a higher alcohol content. The idea as such wasn't bad, for at the place of destination, the beer was then to be drunk in a re-diluted state. Reality, however, proved to be even better: People simply drank the India Pale Ale as it was on arrival – strong, with a fruity hops flavour, and unbelievably refreshing. Red Devil IPA – why did we give our India Pale Ale this name? The name says it all: Our IPA is devilishly red, infernally tasty and strong as hell. Moreover, by enjoying a pint of Red Devil IPA, at least one of our master brewers will shore up his favourite football team with a powerful boost. The Kiwi Ale is a slim Pale Ale brewed after a recipe of our beer sommelier Oliver Schmidt. It's liveliness, which it gains from the slim body that results from the selected combination of light malts, makes it an ideal summer beer. Brewed exclusively with New Zealand hops, this Ale captivates you with a very subtle bitterness and a pleasantly fruity flavor. The four precious types of aroma hops bestow a fine hop flower and an acutely fruity aroma on this Ale. A slight citrus and melon hint go along with strong hints of quince, gooseberry and passion fruit. A breeze of green apple and sweet fruit (as for example kiwifruit) make it all perfect. The so-called Pale Ale is a widespread top-fermented beer (Ale); it serves as a basis for many potential ale-variations. The color of a Pale Ale varies from a light golden yellow up to an orange amber opalescent appearance. Usually, due to an intensive addition of hops, the Pale Ale has a fruity odor with a distinctive hop aroma hint. Kiwi Ale – why did we name our Pale Ale that? The sweet and world-wide favored kiwifruit has become a symbol for New Zealand. Originally it comes from China. Actually it was called "Chinese gooseberry"; in New Zealand it was grown and exported on a large scope. As it soon became typical for New Zealand, in imitation of the kiwi (bird), it was also called kiwi. Today the name "kiwi" is a synonym for the origin from New Zealand and thus the origin of the deployed hop became the eponym for our Kiwi Ale. Our Insane Ale is an Imperial American Ale of extreme creation and extreme alcohol content, characterized by an extraordinary level of bitter compounds and an outstanding hops flavour. It is brewed after a recipe of our master brewer, Holger Schmidt, using exclusively American hops. There are probably only few Craft Beers in the world for which frequently used descriptions such as “of strong character” or “polarising” are more appropriate. Of course, one may discuss endlessly whether it's reasonable, unreasonable or even insane to brew a beer with 19.3% original wort, 90 bitter units and such an extremely distinct hops aroma. So why dub our Imperial American Ale “Insane Ale”?. Because it is insanely good ! Our range of beers won't be complete without an Imperial Stout. Black Magic is characterized by a strong taste with a touch of caramel and coffee, generated by the use of dark roast malt. A combination of a powerful flavour of roasted malt, high alcohol content and 45 bitter units produces a very complex beer strong enough to replace your cup of coffee after a good dinner. Our beer sommelier recommends it to go with a bar of dark chocolate or with your dessert. Beer lovers will particular enjoy our Black Magic on a winter's night in front of the fireplace. Stout is especially popular in Ireland, one of the most favourite being Guiness. Stouts bearing the denomination “Imperial” on their labels are brewed as strong beers with a high degree of original wort. The beginnings of Stout go back to the early 18th century, when it was brewed for the London labourers, who, during the years of the Industrial Revolution, needed a nourishing drink for their arduous work. Stout beers are characterized by a darkish, almost black colour, a very intensive first-sip aroma (chestnut, cocoa, bitter chocolate, coffee), and by a hops-flavour finish. The perfect, tasty drink to quench your thirst – that's our top-fermented wheat-beer. The typical “banana flavour” is generated by way of a selected top-fermentation yeast as well as through carefully chosen hops combinations and wheat malts. A yeasty, pale wheat-beer of top quality!